I am gearing up for my research stay at CERN, leaving Taos on March 1, 2015. Dr. Steve Goldfarb, physicist and Educational Outreach Coordinator at ATLAS has been collaborating with us on the Projecting Particles workshops. He is now preparing a series of visits and tours that will provide a crash course and immersive experience in particle physics. 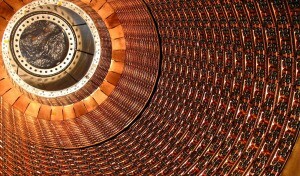 The Large Hadron Collider will fire up after a 2-year technical stop and I will be there for the big day. On the CERN website they explain that, “For the first time on 9 December 2014, the magnets of one sector of the LHC, one eighth of the ring, were successfully powered to the level needed for beams to reach 6.5 TeV, the operating energy for run 2. The goal for 2015 will be to run with two proton beams in order to produce 13 TeV collisions, an energy never achieved by any accelerator in the past. CERN Director-General Rolf Heuer says. “I’m looking forward to seeing what nature has in store for us”.